EDITOR’S NOTE: Check out our review of another desk that Aldi sells, the SOHL Furniture Writing Desk, at this link. My house has small bedrooms, but it would be nice for my children to have desks in their rooms for homework, art projects, journaling, and all the things kids do. 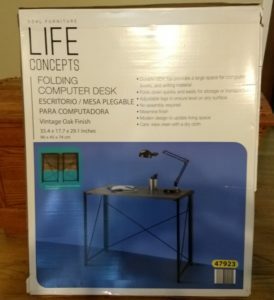 Enter Aldi’s SOHL Furniture Life Concepts Folding Computer Desk. At the time of publication, this desk sells for $29.99 as a Special Buy (ALDI Find). It’s part of Aldi’s collection of back-to-school and dorm room products that the store rolls out late each summer. 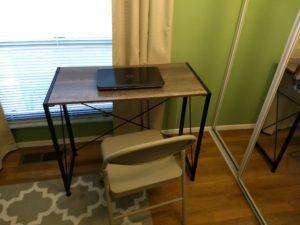 The folding computer desk is small and fits well in my youngest daughter’s 10-foot by 9-foot bedroom. The desk measures 35.4 inches tall, 29.1 inches wide, and 17.7 inches deep. The desk has a weight limit of 80 pounds, but because it’s not that large of a surface, I’m not too concerned about overloading it. It does not come with a chair, and Aldi currently is not selling any desk chairs, but I wish they would. Instead, I’ll be purchasing a chair from Walmart or IKEA. In the meantime, my daughter is getting by with a metal folding chair. The table comes packed flat in a large box. My husband had no trouble fitting the box into the trunk of his Toyota Corolla. It comes with a manual with some basic guidelines and setup instructions. To set up the desk, stand the folded desk upright with the leg frames facing toward you. Pull the leg frames outward. Lift the table top over the leg frames. 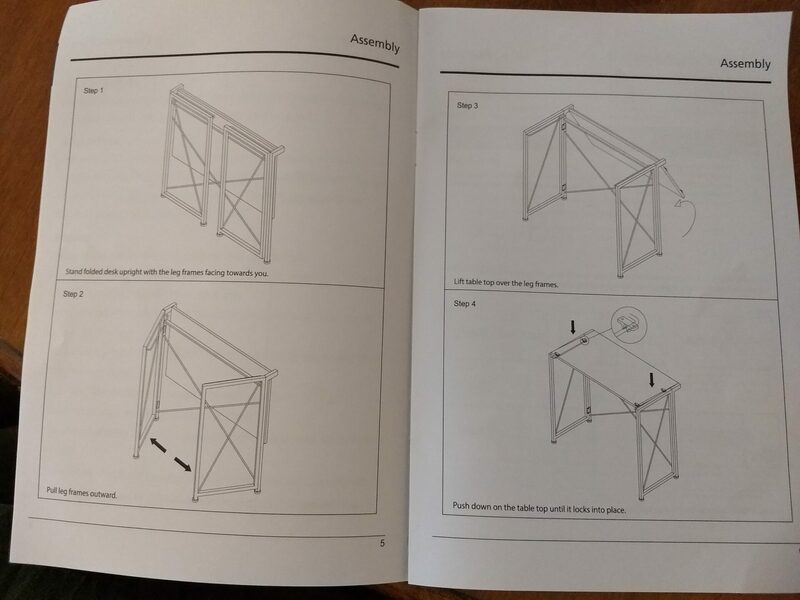 Then push down on the table top until it locks into place. It takes less than 30 seconds to set it up. The desk also comes with a small plastic bag (it’s easy to miss in the large box) that contains hardware to secure the desk to a wall. The desk is so small and lightweight that I don’t see much of a need to secure it to the wall. (Besides, it’s going in front of a large window in my house, so I can’t secure it to the wall anyway.) Still, it’s nice to have the hardware in case you want to secure it. The desk has enough surface space to fit a laptop, notebooks, or children’s homework or art projects. If you need a large work space with storage and drawers, you’ll need to look for a different desk. This desk works well in a small bedroom for an elementary school-aged child, though. Really, it’s good for someone of any age who needs a small desk. I also appreciate the desk’s minimalist design because it does not block light from the window I placed it in front of in my child’s room. I also liked the adjustable feet on the bottoms of the desk legs; my desk is set up where one leg is on a rug and the rest of the legs are on a hardwood floor, and I was able to adjust the feet so the desk did not wobble. I noticed a small, fine scratch about three inches long on the desk’s surface, but it’s only visible when viewed from certain angles and when the light is focused just right. I also noticed the surface finish is a bit rough on one corner, but it’s very small and it took me a while to spot it. The desk is so cheap, though, and I’m not too concerned because I’m sure my kids will add a few scratches and marks of their own. 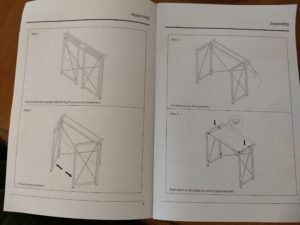 While some SOHL Furniture products from Aldi come with warranties, there is no warranty for the SOHL Furniture Life Concepts Folding Computer Desk, so if you have major problems with it upon opening the box, you’ll want to return it directly to the store. 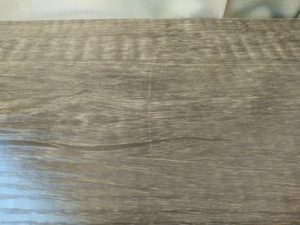 Last spring, I purchased a different desk, the SOHL Furniture Writing Desk, which had a two-year warranty, and I was able to get a partial refund on that desk because it had some noticeable dents straight out of the box. By the way, this current desk Aldi is selling, the SOHL Furniture Life Concepts Folding Computer Desk, has the same dark metal/vintage oak look as the above-mentioned SOHL Furniture Writing Desk that was sold this spring. 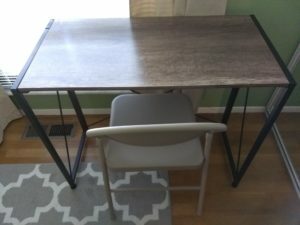 So if you own the writing desk and you’re looking to expand your office or work space, the folding computer desk will match. Aldi’s SOHL Furniture Life Concepts Folding Computer Desk is an inexpensive way to add a small work surface to any room that is short on space. As an added bonus, the desk folds up and stores flat when not in use. It does not have drawers or storage space, and if you need a large work surface, this probably isn’t the desk for you. 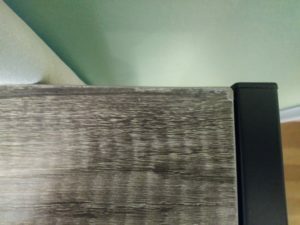 My desk came with a small scratch straight out of the box, but it’s not very noticeable, and my kids (who will be the sole users of the desk) will probably add their own scratches. The desk does not come with a warranty but otherwise seems to be decent for the price. My one wish is that Aldi would sell a chair to go with the desk. Thank you for your helpful review, Rachael. Because I have trouble coping with chemicals off gassing from furniture, it would be great to know if there is any strong/mild or no chemical smell from lacquer or varnish treatments of any furniture product. Thanks, Susan. 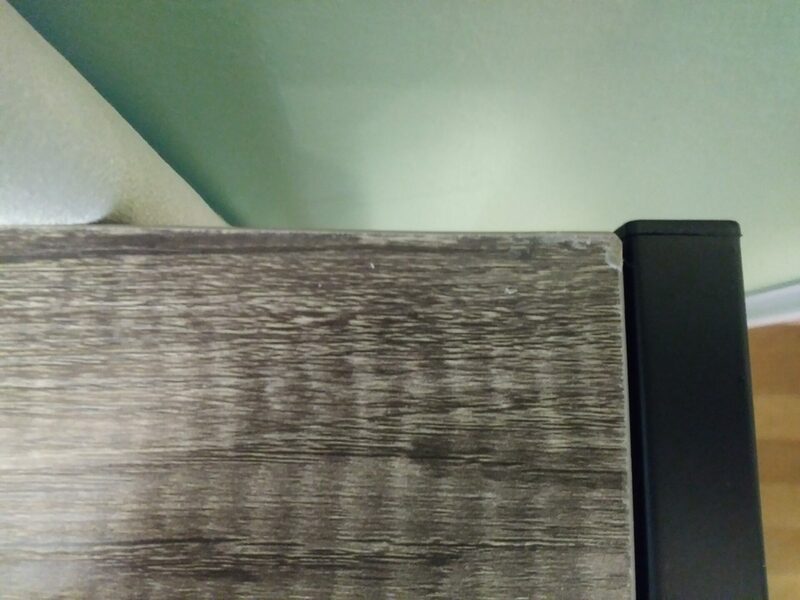 I didn’t notice any strong smell from this desk, or from another similar Aldi desk I own.